A decade ago the cellphone market was locked between Nokia and Blackberry, today between Samsung and Apple. Which makes one wonder - why would Alcatel enter the race in Lebanon at such a late time? 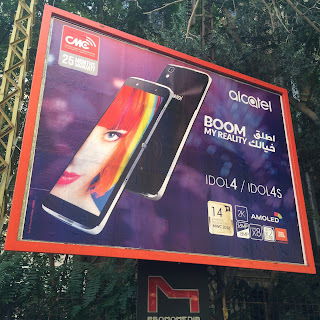 The ad features their Idol4 and Idol4S (which includes a virtual reality box) models, with the line "boom my reality" (in Arabic "unleash your imagination"). I have no clue what the Alcatel model model offers on top of is already in the market (they speak of a boom sound from all angles), but no matter the technical specs, I fail to understand why it took them so long to want to enter the Lebanese market in terms of smarphones (they were still selling the basic phones in select outlets). To be fair to Alcatel their Idol4/Idol4S won 14 awards this year at the Mobile World Congress in Barcelona. Interestingly, it seems Nokia actually bought Alcatel (for 16,6 Billion), so perhaps it is a way for Nokia to acquire market share (not sure if the Lebanese volume of cellphone buying actually justifies this). Or maybe they are targeting the "affordability" segment (specifically via the Pixi and Pop models) even if Samsung already has this locked down with several devices which cover the whole spectrum of prices, plus the fact that with the cellphone being a status symbol Lebanese do not hesitate to spend outrageously on it. So, I have no clue why it took them so long and what kind of splash they expect to make.